Ah, manscaping – that wonderful colloquialism penned in the late 1990s to help the budding metrosexual place their body hair removal in a more masculine context. Not that there’s anything wrong with manscaping; you tend to look better, it accentuates other…ahem, features, and can generally make you look less like you just rolled out of a dumpster. 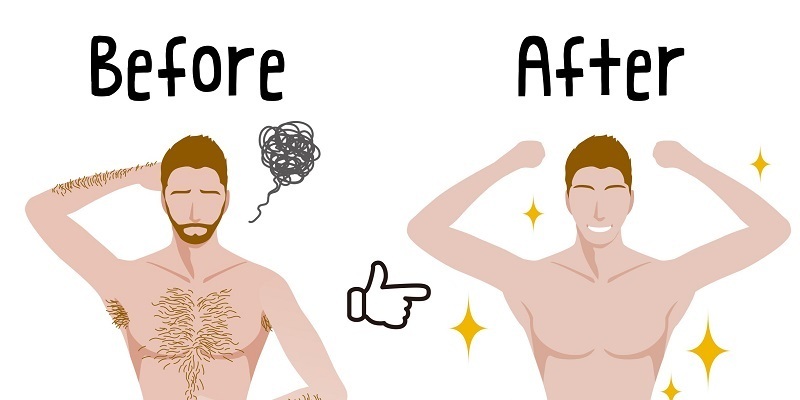 Now that you have decided to travel down the manscaping road, we feel compelled to tell you some of the dos and don’ts that are associated with it. We don’t want you to go from Chewbacca to Princess Leia because you got a little overzealous with the tweezers or razor. Let’s get right to it so that we can then get to the tools that we know you are curious about. Buy the Right Tools: You definitely need to have the right tools to get the manscaping job done right. The likelihood of a razor and shaving cream taking care of your harrier regions is pretty slim, especially for those of you with a furry body suit lurking under your clothes. A lot of big brand companies are including special add-ons to the gadgets that are used for other methods of grooming. We talk about this a bit later on, so keep an eye out. Clean Up Your Chest: Some of you have a bit of hair on your chest and some of you have a veritable forest with woodland creatures included. Clean this area up, but make sure you trim or wax appropriately. It’s up to you how long or short you decide to go. Clean Up Your Underarms: We know that this seems like a weird area to take a weed whacker too, but it’s an area that can quickly get out of hand and a little trim will please the neighbors. There’s definitely supposed to be some hair under there, but if you are able to braid it you should probably give it a trim. Wax On…Wax Off: Yep, we are suggesting that you break out the wax. You don’t have to wax everywhere, but your back and shoulders need to be mowed down. Head to a professional every 6 or so weeks and get it taken care of. If you are prone to skin irritation you may want to opt for laser hair removal as an alternative. All Signs Point South: Carefully maintaining the hair…well, down there, is a definite “do”. Keep it looking natural, but still nice and neat looking. This is also a way to enhance the appearance of certain features and we don’t mean your eyes. Say “No” to Home Waxes and Sprays: Save the DIY stuff for building a beer pong table and skip it when it comes to your manscaping routine. The hair removing stuff that you see at the drugstore should be avoided at all costs unless you are in the market for a painful rash and possibly a little bloodshed. Clean Shave Anything: That kind of hurt us to even type that last bit out. Think about trying to cut down a field of shoulder high grass with only a weed whacker, now apply that to mowing down your body hair for the first time with nothing but a disposable and shaving cream. Not a good idea, guys. You’ll be left with patches of rough hair, razor burn and maybe the odd bit of skin missing in some places. Trim before you shave…trust us. Forget About Bringing Up the Rear: We all know that men’s backsides aren’t exactly baby smooth and that’s just fine. Feel free to trim up a bit, but please don’t bring back your pre-pubescent years. We’ll just leave it at that. However, with manscaping, you need the best manscaping tools. Don’t fool yourself into thinking that regular old safety razor (or even your normal electric razor or mustache trimmer) will do the trick – after all, unless your night job is as a circus freak, the contours of your body are much different from the curves and edges of your face and chin. Luckily, we’ve got a rundown of some of the best manscaping tools for your body, and for your wallet – with luck, you’ll be the opposite of Robin Williams in no time. Maybe the priciest, yet best manscaping tools out there is the Philips Norelco BodyGroom 7100, at $69. That may seem like quite a lot to spend on a supplemental razor, but fear not – it can do everything you need it to! In the same shower session, you can give your beard a nice trim, then immediately move down to shave your chest in equal measure. Now that’s multi-tasking. One of my favorite features of this tool is its pivoting head, which moves with the contours of your body, basically ensuring you don’t give yourself some nasty scars you’ll have to make up cooler stories for later. It also comes with a pretty sweet stand and three adjustable guards, making it something you won’t mind keeping out in the bathroom. If you want something pretty barebones, but multipurpose, the Wahl Manscaper is a pretty useful multitasker. It’s shaped just like a regular old barber’s trimmer, but slightly smaller so you can fit all those little nooks and crannies (you know what I’m referring to) that you might not hit otherwise. It comes with three different interchangeable blades, which let you tackle all the basic manscaping needs you might have – chest, back, legs, and other places where the sun might not shine so much. The Wahl doesn’t have a whole lot of frills to it, and its grey-and-black color scheme doesn’t inspire the eye so much, but it’s a manscaper – you don’t need it to look pretty you just need it to get the job done. It holds a charge for up to about an hour, so if you’ve got a pretty tough job to do, you won’t have to worry about taking a break to charge. All in all, at $34, it’s not a bad deal at all for all the manscaping prowess you’ll really need. If you need a little more detail in your body grooming, the MANGROOMER (bold name, eh?) is probably what you’re looking for. Primarily used to trim facial and other head-based hair, the MANGROOMER is also secretly one of the best manscaping tools you could hope for. It comes with a million little attachments for everything you might possibly want to do – trimming ear and nose hair is a snap, and it can trim your neckline, sideburns, and eyebrows like nobody’s business too. While the attachments are mostly for very specialized purposes, it’s not hard to reapply them to your back and chest hair. Plus, the more precise nose and ear trimmers can help work on trouble spots where you might want to be a little more careful. The MANGROOMER is a really good purchase, since it gives you just about any gadget you might need in your quest to look like you were sculpted from marble. Check out this fantastic video on the art of manscaping by our friends at DetailsForMenVideos. Unlike some of the other best manscaping tools in this guide, the Razorba is mostly a uni-tasker – a device that serves one purpose. This simple little gadget is basically a safety razor for your back, with its long blue handle you can use to reach the lower side of your back and just shave it like you would with any non-electric razor. The benefits of the Razorba are pretty clear, despite its stripped down look – it’s a bit cheaper than other manscaping tools at about $27, and it doesn’t run on batteries. It’s incredibly easy to use, too, since all you’re doing is shaving like you normally do; you’re just not using it on your chin. The design is pretty unique, looking not unlike a contoured woman’s shaver made for a giantess; still, you’ll find it easy to use and effective at getting that annoying back hair. Think about it this way – the other tools seen here don’t have nearly the reach the Razorba has, so if your back is your trouble spot, I’d give this one a look. Braun is probably one of the most well-known companies in the electric shaver business, so you know that there’s a bit of corporate backup for this one. The Cruzer 6 is probably one of their best manscaping tools, and it’s got all the bells and whistles that you might expect, including the Gillette Fusion wet shaving technology that makes it absolutely perfect for manscaping in the shower. The versatility of the Cruzer 6 is pretty immense, and goes a long way towards making it a smart purchase. There’s a combo mode setting on it that allows you to shave and trim in a single motion, making it absolutely ideal for the discerning and time-efficient manscaper. Don’t worry about cutting off anything valuable, though; the safety is pretty foolproof, and it’s nice and big so it won’t cut anything you don’t really mean to. At about $48, this body shaver is a bit more on the pricier side, but you’re paying for all the extra bells and whistles (which are actually needed) and the comfort in knowing you can get Braun to help you out if you have questions or need a return. I can dig that.